Thrift shopping is one of our favorite things to do. We love the moment when we walk up and down the aisles of the thrift store and make an unexpected discovery. The thrill of the hunt is so exciting – but even more than that is the thrill of coming up with ideas for our discoveries. 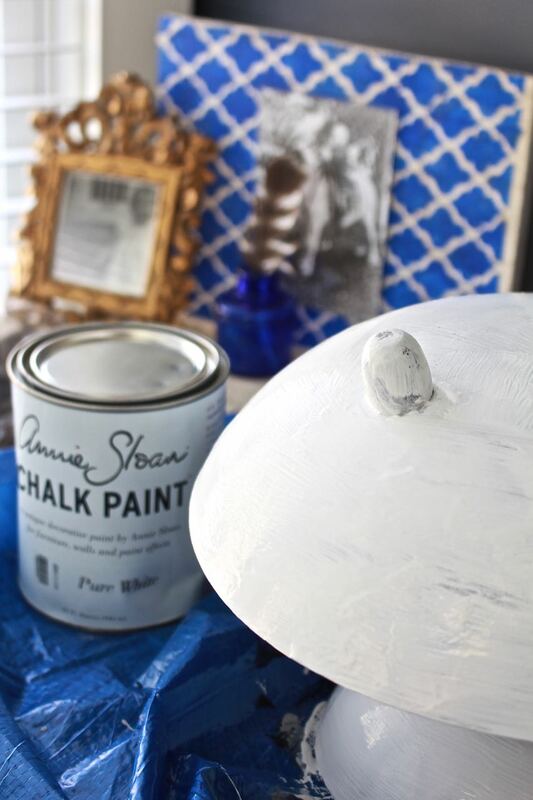 You know how it goes…”this piece is cool”, “wow…what can we do with this?” Each of our homes have thrift store upcycle decor. 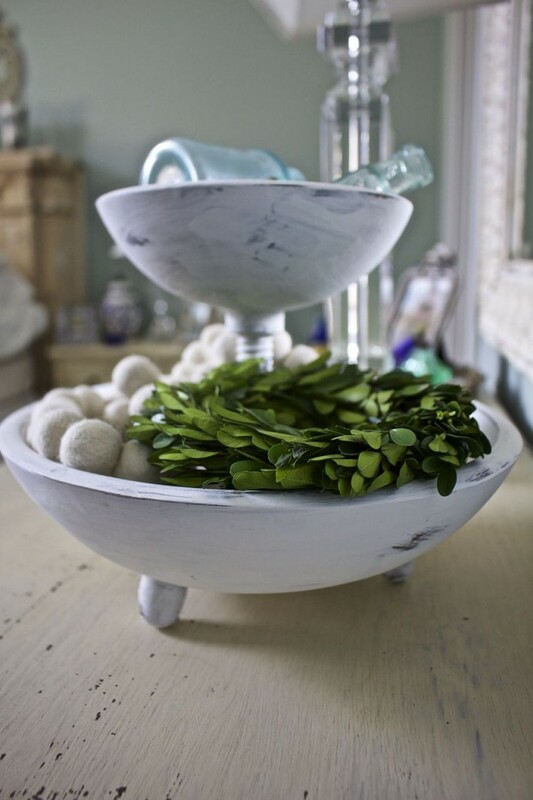 That’s how we came up with today’s post for our farmhouse tiered bowl. But wait – we are getting ahead of ourselves. 2 Bees in a Pod are so excited to be part of the monthly feature of Thrift Store Decor Upcycle Challenge! We have joined forces with lots of bloggers and have tons of thrifty upcycle ideas to get your creative wheels spinning. This tiered stand was spotted at a local thrift store. Not to be gross, but it was filthy and sticky. We looked past that and the orange finish because this piece is awesome! Someone stated that they thought it was a nut bowl. Our research turned up empty, but we are certain this is a kitchen item. The best part? Check out this .99 cent price tag! Cleaning the bowls was the first step – they were even more gross than we first thought. 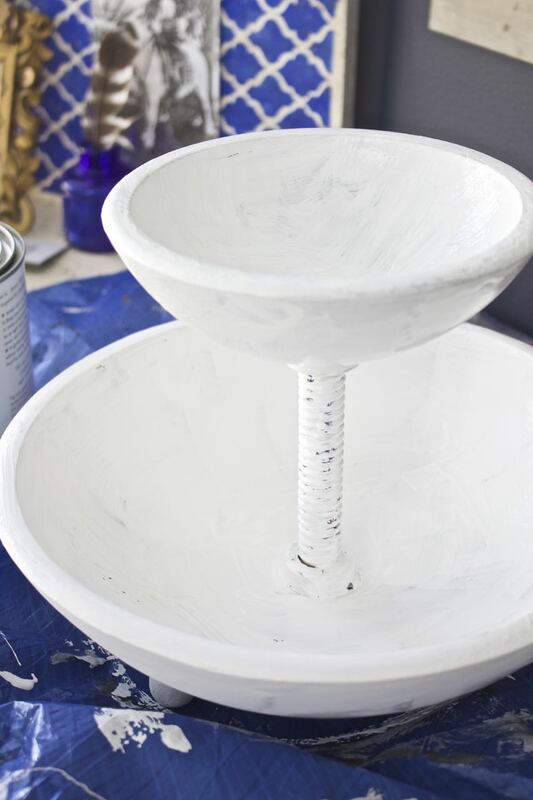 Once the bowls were dry we began painting the entire piece with two coats of chalk paint in pure white. Being that we wanted this to look like a vintage piece with multi layers of paint, our brushstrokes were haphazard. Once it was completely dry we used sandpaper for a weathered look. We are always looking for unique ways to display our collections. 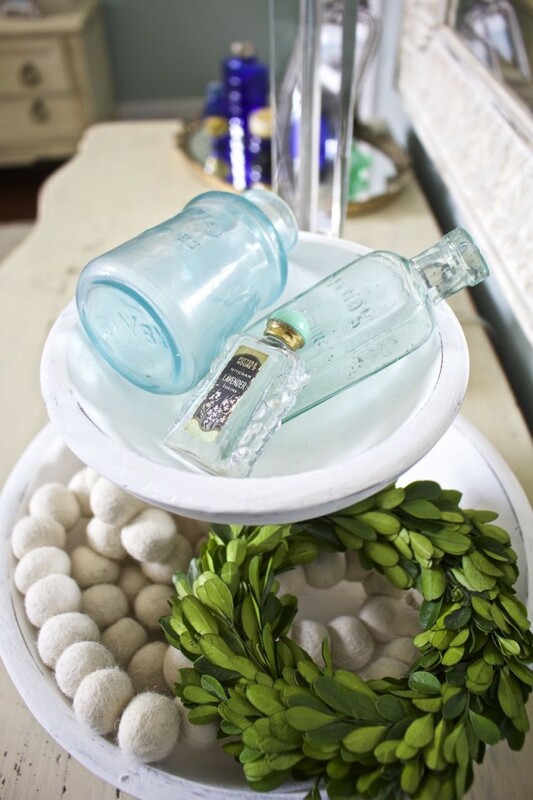 These vintage bottles are definite faves and deserve to be seen and not stashed away in a cabinet. 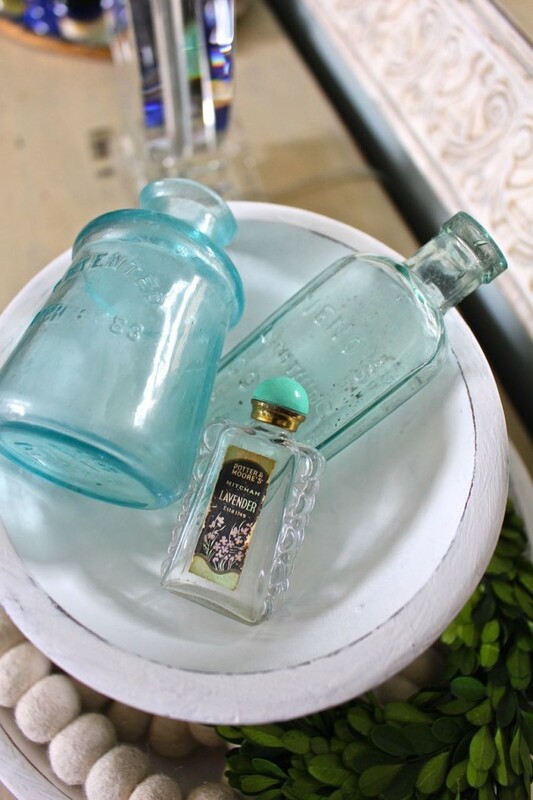 The aqua bottles are from the late 1800’s, while the perfume bottle is dated to the 1950’s. This would also be great to hold jewelry or our vintage skeleton keys. We love the little legs on the the bottom of the bowl. For now, this is displayed in the bedroom. 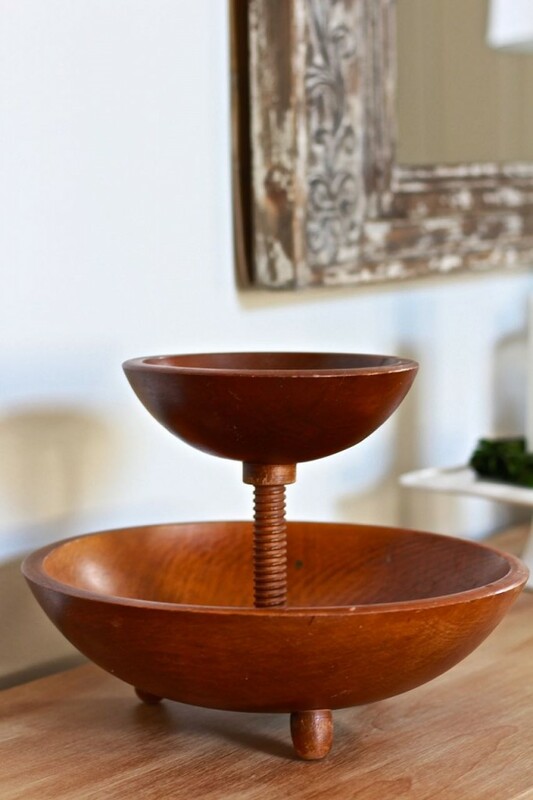 We are most positive that this farmhouse tiered bowl will be used in many rooms in the house! Check out what our fellow upcyclers created below! Great ideas. Thank you ladies. I can’t believe you snagged that for 99 cents! That is CRAZY! Love the transformation. So much fresher looking with the chalk paint! Nothing like a thrift store deal! What a great upcycle! Awesome. 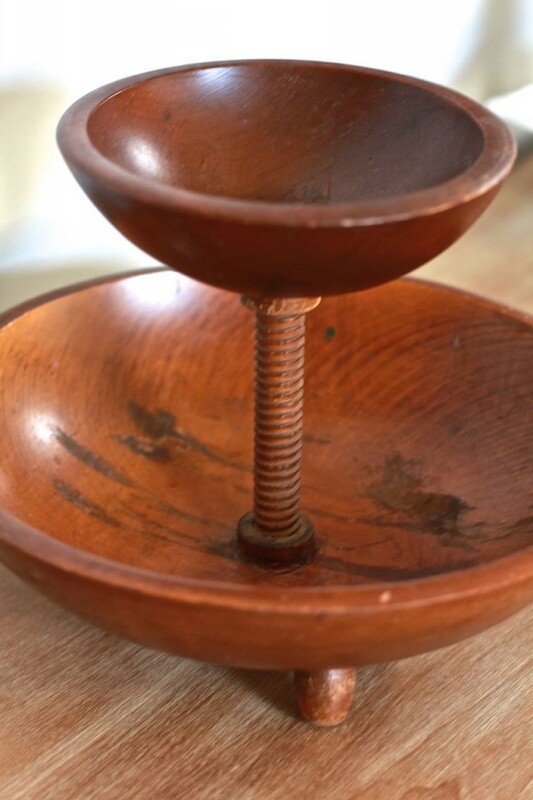 It’s definitely a nut bowl, my grandmother had the same one in her house when we were growing up. Love me some chalk paint!!!! I love this! 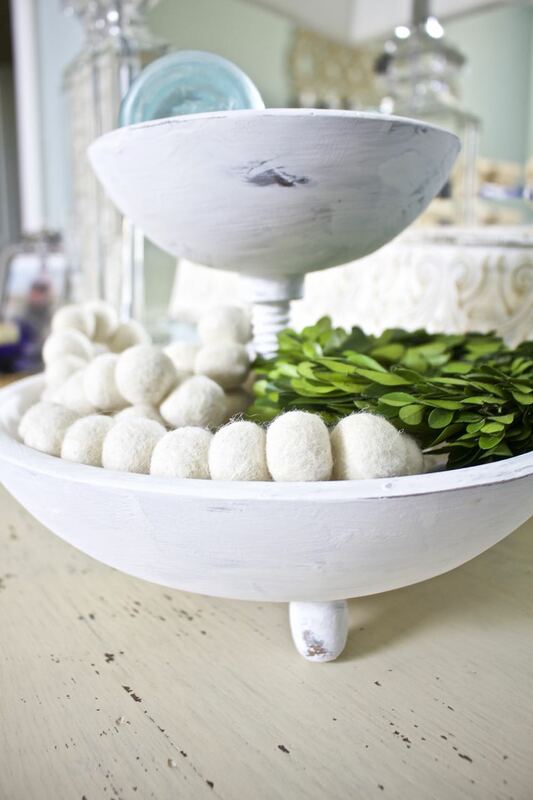 Tiered bowls are such a great storage solution! What a fantastic find. It is a piece that is so versatile. It looks so nice in the new paint color. I adore this! You were so lucky to find such a unique piece. Such a great makeover, it was in need of some serious love. And at $0.99 you can’t go wrong, love it! I’m so glad to be joining you ladies for this monthly challenge. I can’t wait to see what you do next month! I totally would of snagged that up! Great makeover, it’s much better white. This item was a great find — and your makeover is perfect. Organization + pretty = my fave!! This turned out so pretty! And for $.99??? What??? I love it! Great job ladies. I want this! It would look fabulous in our bedroom holding my jewelry or in the dining room on the table! 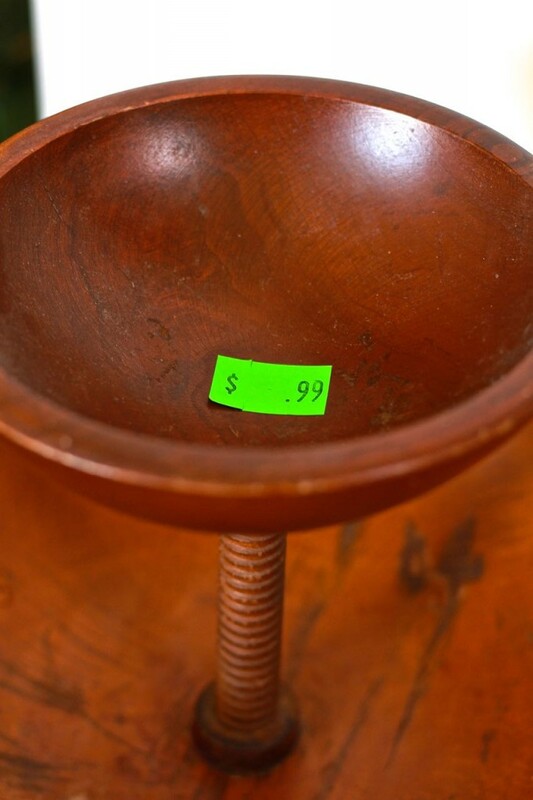 I love this tiered bowl and I’ll be keeping my eyes open when I hit the thrift store. Thanks for the inspiration. When I first saw the picture I thought you put it together and I was like, how did they attached the screw thing?? Then I saw you bought it like that and for .99!! I’m crazy jealous!! I would have picked that up in a heartbeat! I absolutely adore the way it looks painted and how you have it styled! Too cute! I love that way it turned out. It’s crazy what a little white paint can do to a thrift store find! What an amazing upcycle!!! I love it!! 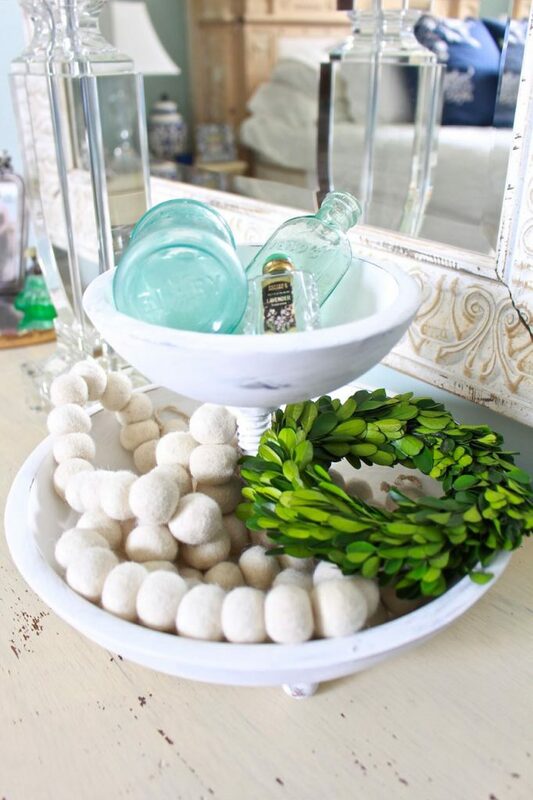 I not only love this upcycle, but I love how you styled it! Beautiful! Love it! Growing up in our house the large bowl was for salad and the small bowl was for an individual salad serving! My mom would rub a clove if garlic in our small bowls to inhance the salad dressing flavor!